Med-Chemist: New cyclopropane derivative as better antidepressant ? New cyclopropane derivative as better antidepressant ? We know that most of the antidepressants have side effects such as constipation, dry mouth, drowsiness and hypotension, or low blood pressure. Amongst various trypes TCAs, tricyclic antidepressants also have the above mentioned side effects. In recent times, the TCAs have been largely replaced in clinical use in most parts of the world by newer antidepressants such as the selective serotonin reuptake inhibitors (SSRIs) and serotonin-norepinephrine reuptake inhibitors (SNRIs), among others, though they are still sometimes prescribed for certain indications. 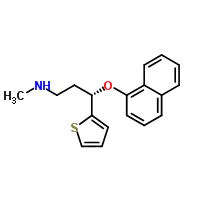 Duloxetine, is a serotonin-norepinephrine reuptake inhibitor manufactured and marketed by Eli Lilly. It is effective for major depressive disorder and it is as effective as venlafaxine in generalized anxiety disorder. Duloxetine failed the US approval for stress urinary incontinence amidst the concerns about liver toxicity and suicidal events; however, it was approved for this indication in Europe and Canada.